It’s Saturday morning, January 31, 2009. I need to drive my son to an event over in Philadelphia, so I woke a little early to get a few things done on the Internet and get directions to the event before leaving. So I hop on, check and respond to some e-mail, visit Facebook (see also Facebook Tips & Etiquite for Business), then, with minutes to spare, go to Google to look up the event. I type in the name of the school and get the usual myriad of results. The top search results are exactly what I need. Good, because I have little time to spare. But wait … the site is marked “This site may harm your computer.” What? Never heard of it before. No way. This has to be wrong. 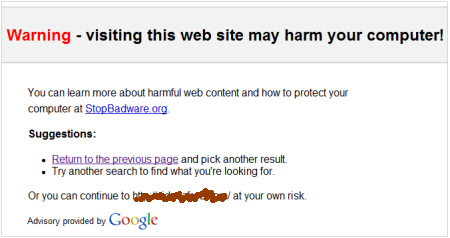 I click on the link anyway and rather than proceeding to the site, I am presented with a Google screen that explains that the site is potentially dangerous, and will not let me visit the site. Well, that’s a fine mess. The Geek in me kicks in. I read the URL and copy-paste the web address into my browser bar. Up pops the correct website – safe and sound. I snag the directions and I’m off. But not quite. What was that all about? I sat down for a little experiment. I searched for “philadelphia restaurants”. 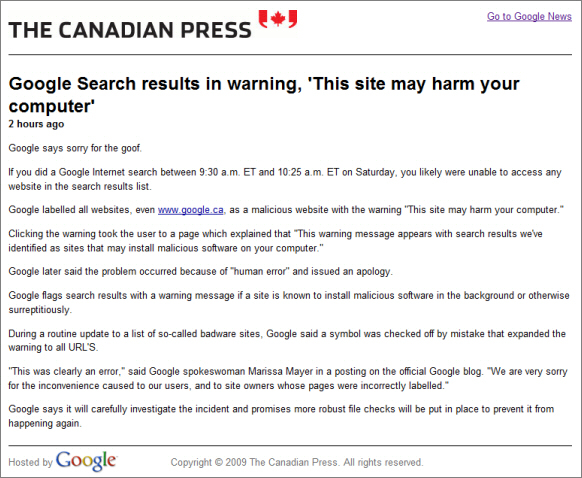 What to my surprise, EVERY result listing was marked “This site may harm your computer”. “Shoot” I thought … “I’m infected. There’s no way every site is dangerous”. I went to another computer. Same result. Hu? And there’s NO WAY Google has a problem … right? Arghh. No time now … got to go. OK, I’m back. And things seem to be all right. But what happened? I Googled “this site may harm your computer”, and faithfully(?) Google responded with the answer. The first answer came from a Canadian post , ironically served from Google.com. Turns out that Google put a protective browsing scheme in place to prevent people from visiting potentially dangerous sites. The warning is displayed whenever you visit a site so tagged. <shameless_plug id=”SonsWebComic”> TrueVillains.com </shameless_plug>, every site was being (inadvertently) blocked by Google. With Google handling 70-80% of all search traffic, this means that millions of websites were rendered unreachable. Which begs a question. Does your business rely on only one Search Engine? Are all your eggs in one basket? Could your business survive if Google simply – went away? Granted, this is not likely. But the events of the day should give us pause. The lesson: Your Internet Marketing campaign should be well rounded and diverse, just like your financial portfolio. It needs to take advantage of the internet as a whole, not just a handful of resources. Internet Marketing can be a daunting task. If you’re like most merchants, you want to focus on the business of running your business. Search Engine Marketing is a time consuming task that requires attention to detail, especially in the start-up phase. Sewell Computer has over ten years maintaining and promoting our client’s web sites. Sewell can help get your Search Engine Marketing Campaign up and running through extensive keyphrase research, campaign management, search engine optimization, and monitoring your return on investment. Start an e-mail marketing campaign. One of the best things you can do to improve your business is to keep in contact with customers and past prospects. Make sure you collect e-mail addresses from everyone you can. Then, periodically send them an e-mail with promotions, specials, or other useful information. Keep your company in their minds, and they will be more likely to come back when they need your products and services.